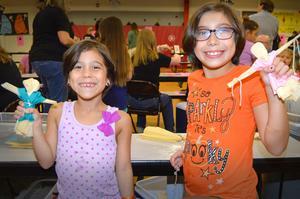 The excitement of fall was in the air October 9 as Goodwin Frazier Elementary School hosted its annual Heritage Night. The event served as a celebration of New Braunfels’ history, including the smells, sounds and sights of local food, music and dance. event served as a celebration of New Braunfels’ history, including the smells, sounds and sights of local food, music and dance. Students, families and community members lined up to take part in a number of activities at the annual event including butter churning, German lessons and crafting corn husk dolls. Others took turns using an old-fashioned corn grinder and decorating festive fall cookies. Students had “passports” to fill out, earning stickers for participation in each station. In addition to the hands-on activities, visitors observed the New Braunfels Smokehouse making sausage and the Heritage Society showing off their weavings and textiles. There was also a photo booth, silent auction and raffles throughout the evening. traditional German dress. Omas and Opas lead students in dancing to German music throughout the evening. Heritage Night takes place thanks to the Comal ISD Curriculum & Academics Department, the Greater New Braunfels Convention & Visitors Bureau, and the Ammo Group, along with enthusiastic participation from a number of local sponsors including Wurstfest, Schlitterbahn, the Heritage Society, McKenna Children’s Museum, New Braunfels Smokehouse, Bat Conservation International, Natural Bridge Caverns, the Sophienburg, Charlie’s Bee Company, the Headwaters of Comal, Naeglin’s Bakery and the New Braunfels Fire Department. This year a Resource Fair was added to the event and included representatives from the City of New Braunfels, the Food Bank, the Health Department, Volunteers in Medicine and many more. While much of the focus was on the German heritage of town, Mexican culture was celebrated as well with Dia de los Muertos displays, activities and music. The entire Comal ISD Curriculum and Academics team was delighted with the robust turnout for the annual event.